Samsung Galaxy S4 pre-orders go live in Canada | Android Blast! Telus is now taking pre-orders for the Samsung Galaxy S4. Users can no sign up to get the new Galaxy S4 for $199 from Telus. To get the $199 price users will choose the 16GB version, and will have to agree to a 3-year agreement. The S4 is scheduled to start shipping on April 27, and be in stores on May 3, 2013. TORONTO, April 15, 2013 /CNW/ - TELUS and Samsung Canada are pleased to announce that the Samsung GALAXY S4 is available at TELUS for pre-order today at www.telusmobility.com/GALAXYS4. Customers who pre-order the GALAXY S4 will be the first to receive their devices starting on April 27 with in-store availability beginning May 3. The Samsung GALAXY S4 will be available on TELUS' blazing fast 4G LTE network for $199 on a 3-year term with a minimum $50 monthly plan before tax or $700 month-to-month. TELUS' 4G LTE service now covers more than 70 per cent of the Canadian population across approximately 170 markets. The fourth generation of the successful GALAXY S family was designed with insight from consumers to truly understand what matters most in their lives. With an enhanced feature set, the technologically innovative GALAXY S4 truly enables Canadians to live in a world of infinite possibilities. Designed to get Canadians closer to what matters and make every moment meaningful, the GALAXY S4 gives consumers great enjoyment through enhancements to the user interface. New navigation features include 'Smart Pause', which allows users to scroll the screen based on where they are looking. Another feature is 'Air View' which allows users to hover their fingers over the screen to preview the content of an email, S Planner, gallery image or video without having to open it. And with 'Air Gesture', users can change the music track, scroll up and down a web page, or accept a call with a wave of the hand. The device features a highly crafted design that surrounds a larger screen size and battery, minimized bezel; all housed in a light (130g) and slim (7.9mm) shape. The Samsung GALAXY S4 is slimmer yet stronger, with less to hold yet more to see, with the world's first Full HD Super AMOLED display. Equipped with 13 megapixel rear camera, the GS4 also boasts a 'Dual Camera,' that allows simultaneous use of both front and rear cameras and enables functions such as 'Dual Video Call', allowing users to make and receive a video call with friends and family while showing what you are looking at during the call. "Samsung is a consummate innovator and their dedication to delivering devices that enrich people's lives shines brightly in the new GALAXY S4," said Dave Fuller, Chief Marketing Officer, TELUS. "Our customers demand more from their phones today. They want devices that keep them connected and enable them to balance their personal interests while helping them to be more efficient - all this from a service provider that listens to them and provides an outstanding service experience on a fast and reliable network - a service provider like TELUS. 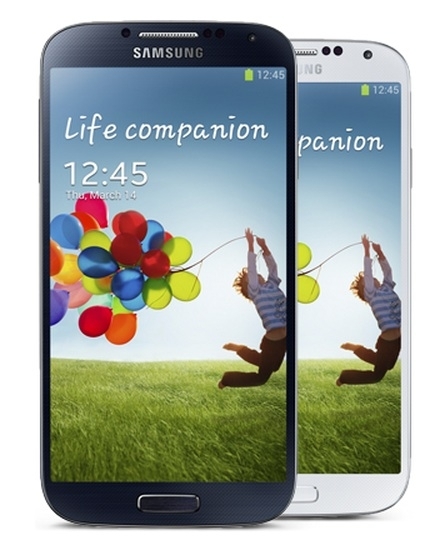 We combine the awesome GALAXY S4 with programs such as TELUS Learning Centres and the largest 4G LTE network in Canada." "Samsung is proud to bring the highly anticipated Samsung GALAXY S4 to Canadians on the TELUS network," said Paul Brannen, Vice President, Enterprise Business Solutions at Samsung Canada. "The GALAXY S4 was developed based on consumer insights and needs and this device is a proof point of people inspired innovation. We feel that the GS4 will truly enhance the way Canadians live, inspiring them to capture unforgettable moments in more ways than ever before." The Samsung GALAXY S4 is available to pre-order today from TELUS with device delivery commencing on April 27, and in-store availability starting May 3. At Canadian launch, two color options will be available - Black Mist and White Frost; with additional color options to follow later this year. For further product and availability information, please visit www.telusmobility.com/GALAXYS4.